We’ve all heard these statements or ones like them. And they are true, aren’t they? Apparently, human minds are wired to be able to speculate about what others are thinking or feeling. When she was a cognitive neuroscientist at MIT, Rebecca Saxe discovered there is a specific part of the brain that becomes active when we think about how others think and feel (TED Talk, 2015). Some scientists have hypothesized that the human brain evolved to be able to do this as a survival skill, an essential skill that enabled humans to determine if another was friend or foe. However, experiments demonstrate that we do not always get it right. Let’s try our own experiment. What’s going on with this student? Did you say he’s bored? Working with pre-service teachers (aka, college students), I found that the majority said this student was bored. Some said he was tired. When asked why they said that, the students would say they could tell by the way he was sitting, or the expression on his face. But do we really know what is going on in this kid’s mind? When I was a principal, there were teachers who were very frustrated with a student. “She’s lazy!” they said. “She’s always daydreaming!” “When I call on her, I never know if she is going to answer or just stare at me.” “Sometimes she looks at me like I’m not even there, like she’s boring holes in my with her eyes.” The teachers complained to me and to the parents. These parents wondered if something else might be going on. They took their daughter to the doctor, to a psychologist, and other specialists. Eventually, they asked to set up a video camera in the classroom. The camera was rigged so that the students would not know if it was on or off, and the student was filmed over the course of a week. The result was that this little girl was diagnosed with petit mal seizures. She wasn’t bored, or daydreaming, or staring holes in the teacher. Her lack of attention was not something she was doing on purpose. She had a serious medical issue — one that might not have been discovered if the parents had only relied on the opinion of the teachers. So let’s look at this photo again. What is going on with this student? Well, yes, he could be bored. He could be tired. He might have a headache, or have a neck injury, or just being hungry. He could be frustrated that he was not called on. He could be trying to keep up with the lesson even though he doesn’t feel well, or even though he doesn’t understand everything being said. Would it make a difference in our beliefs about what this student is thinking if we were told he is a second language learner? If we were told he was moved from one foster home to another in the middle of the night? If we were told he had an IQ of 140? The teachers who described the little girl who had the petit mal seizures thought they were accurately relaying information about her. They were not trying to be malicious or trying to deal with her unfairly. Sadly, they were labeling what they thought was going on rather than reporting exactly what they were seeing and hearing. Back when I worked in juvenile corrections, I was trained to report only what was observable and measurable. This was a difficult thing to learn to do, but it was essential to how this particular institution dealt with the students/inmates. Why? Well, because we really do not know what is going on inside another person’s mind. We may pride ourselves on our ability to read body language or to spot “tells”, but we don’t always get it right. On top of the chance at being inaccurate and unfair, when we use terms like “lazy”, “unmotivated”, “day-dreaming”, or “bored”, we are demonstrating that we have formed an opinion about the motives of the student, and that reveals the opinion we have formed about him or her. In a previous post, I discussed how we form opinions of students that become self-fulfilling prophesies. We develop an opinion about how capable the student is and then we treat her a little bit differently based on those beliefs. We might call on her less if we think she is not as capable of answering a question. We smile less at those students we believe are less capable, and we talk to them differently. In short, we create a very different socio-emotional climate in the classroom for the students we believe are “good” or “better” than we do for those we believe are “less capable” or “naughty”. 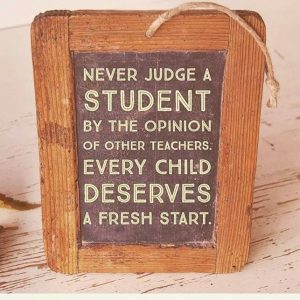 However, if we are not always accurate about what we think is happening with a student, is that opinion fair? The fact is we cannot see what is going on inside a student’s head. The expressions and body language for many feelings and emotions are quite similar. because that’s the truth in people’s minds. This phenomenon is something linguists have been exploring since the 1930s: The words we use and how we label things shapes our thinking about those things. Adults are usually better at masking what they are thinking than children are. Adults have usually learned to pretend to pay attention, to be engaged, even when their brains are actually planning a grocery list, thinking that the speaker’s hairstyle is unflattering, or when thinking about how happy they will be so see their significant other later in the day. But children do not have that skill, and while many will learn it as they enter adolescence, not everyone does. Human brains do not reach full maturity until age 25 or so. So what is the take-away? If we have become frustrated with THAT student, we might find ourselves labeling what THAT student is doing as being something negative when it really might not be. 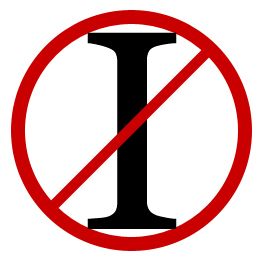 That negative opinion will have an effect on how we treat him or her, and how we treat THAT student effectives his or her behavior until s/he lives up or down to our opinion of him or her – if we believe s/he is a trouble-maker, s/he will become a trouble-maker even if s/he wasn’t beforehand. Yes, humans are wired to make assumptions about others based on what we see, but we must remember, sometimes we get it wrong. If we really want to turn THAT student around, we have to train ourselves to report on just what we see and hear, what is observable and measurable. We will look at some other uses for using observable and measurable terms in another post. Posted on October 15, 2018 October 15, 2018 Categories Observable and measurable, Self-Fulfilling ProphesyTags classroom management, negative behavior, negative opinions, observable and measurable, perceptions, self-fulfilling prophesyLeave a comment on Is Seeing Believing? In the last few posts we looked at some of the reasons why THAT student may have become THAT student. The main idea was to look for positive things about THAT student, and that would shift your focus a little bit. Today we will look at a couple of management ideas. Remember, classroom management is not discipline. Management is how the classroom is run. Discipline is about what we do when a student steps out of line. One thing that happens when we have THAT student in class is we start to call on students to answer questions a little bit differently. First, we tend to call on students we think are most able to answer the particular kind of question we are asking. If we subconsciously think Aaron is more capable, we call on him to answer questions that take higher levels of thinking. If we subconsciously think Leia is less capable, we call on her to answer questions that have yes or no answers, or questions that involved low level thinking skills. I got to thinking about who does and who does not raise their hand, and about how we educators subconsciously direct particular kinds of questions to students who we think are capable of answering them. I wondered how I could get every student to participate in answering questions without my subconscious running the show. The solution was Roe’s Card Trick. Here is how it works: Write each student’s name on a 3×5 card. (Or you can buy half size cards. I liked the half size ones but I used to cut my cards myself. I liked the half sized ones because they fit into the too small pockets manufacturers put into women’s pants.) You now have a deck of X number of cards. You can use this stack to call on students. You ask a question, look at the name on the top of the deck of names, and then put that card on the bottom of the stack. That’s where I discovered a flaw. I discovered that once I had called on Aaron and put his name at the bottom of the stack, Aaron figured he will not be called on again until every other student in the class was called on. That gave Aaron “permission” to start doing everything except pay attention to what was going on in class. The solution was to have a second deck of cards with the students’ names. Now you have a larger deck of cards and every student’s name is in the deck twice. Students don’t know if their name is going to be first and fourth or tenth and twentieth. Here is the procedure I taught the students. Do not raise your hands to answer questions. I will call on you using this deck of cards. Each student’s name is in the deck twice. I will shuffle the deck regularly so we don’t know where your name will come up. You will have to pay attention to be able to answer a question when I call on you because you won’t know when the cards will turn up your name. Because your name is in the deck twice, I could call on you right now and you don’t know if your name will be next again, or if it will come up again 15 names from now. Now you may be thinking, what if I don’t know the answer? That’s not a problem. If you don’t know the answer after a few seconds, I’ll put the card back into the deck more into the middle. That means you’ll probably get called on again soon. But it also means that nothing bad happens if you don’t know the answer. Let’s try it out. Here is the question: How do you get a turn to answer questions? (Look at the cards and call on the student whose name is on top.) Leia? Yes, that’s right. I will call on students using the cards. Next question is this: . . .
With a little practice, students got the idea. They liked that it wasn’t real high stakes to get called on to answer a question because they could pass without a penalty – and in the first couple of weeks that I used them, I would make sure it was not the least bit high stakes by making sure my face was in neutral if a student didn’t know the answer. We both liked that things moved along faster because I was not waiting to see who raised their hands. As time went on, I discovered another use for the cards. I changed the cards a little bit. I used two different colors of cards. Let’s say one set of cards is yellow. Each has a student’s name on it. The other set of cards is green and each has a student’s name on it as well. Shuffled together they look pretty colorful and can be used as described above. But when it is time to divide students into groups, the teacher can separate out one color of card, and then deal those out into however many groups s/he wants. The students see that the group members are being selected randomly and they feel less targeted. And because the groups are changed with every group project, they know whomever else is in the group, it is a temporary grouping. Class, in just a minute I’m going to put you into groups to ___ (whatever the task is going to be). Are you ready? Okay, do NOT move until I’ve said all the names. When you hear which group you are in, hold up that number of fingers to you don’t forget. Do you know what group you are in? You may go to your group’s area now. I found it was useful to use some humor when looking at who wound up in which group. For example, I had two young men in a seventh grade science class who had been best friends since they were born. They had a bit of a problem being in a group together because they would talk about off topic subjects. So if their names came up in the same group, I’d dramatically act like that was the worst thing ever and raise my eyebrow at one or the other. They’d laugh and I’d continue with the melodrama and say something like, “Well, if you are sure you can manage to work together . . . “ They’d laugh some more and we’d move on. I would usually deal out the cards for the group very quickly, and then scoop them up and reshuffle them quickly as well. That was so the students didn’t get into the habit of looking at the names I’d dealt. Why? Well, besides the fact that I wanted the students to listen the first time, I have a little confession: I didn’t always tell the truth about whose name was in which group. If two students were likely to attempt to kill each other if they were in the same group, I’d quickly change one of the names out of that group and into another. The students were none the wiser. I’d show them the names just often enough that they thought I was always being honest. Okay, I have a second confession: I wasn’t always honest about whose name I called when asking questions either. But I was pretty careful about this. I only skipped over students if I thought someone was having a very, very bad day. I don’t mean like they had an argument with a friend kind of bad day. I mean the “he didn’t get any sleep last night because his parents were too drunk and too loud” kind of day. What this illustrates is that if you introduce your own “Card Trick” to use with your class after the school year has begun, you will need to allow students a little bit of time to practice the procedure before it becomes an established routine. If you want to make absolutely sure that you are not subconsciously directing only certain kinds of questions to certain kinds of students, and that you are being completely fair in creating groups, use the Card Trick. It honestly works great! The plan for next week is to look at my godmother’s statement of “Never ask questions you don’t want to know the answer to”. We all know relationships are a very important part of being a teacher. Who hasn’t heard the saying that kids won’t care about learning unless they know you care about them? In the last two posts, I’ve encouraged you to try to find something THAT student does that is positive. Looking for the positives in a student can change our whole perspective! There is another person (or persons) with whom we need to establish a positive relationship: the parent. If you are like many teachers, you read that line and rolled your eyes. After all, if THAT student had parents who cared, would s/he be such a challenge? Let me share a little story about me. I have a son. When he was a child, he was very challenging, both at home and at school. From what I head from teachers, A was rude, defiant, lazy, distracted, and he did not turn in homework. I used to feel sick when it was time for parent-teacher conferences. I wouldn’t sleep the night before. I knew I would hear a litany of negative things about the little boy I loved. To make matters worse, I was an educator, for goodness sake! I knew what was expected of a child in school. I knew how to get 30+ kids in a single room to behave and how to instill a sense of self-discipline. What A’s teachers did not seem to know was that every day I did all of the things that I knew were supposed to work, all of the things I had suggested to parents during a parent-teacher conference myself. I never found a particularly good way to tell the teachers that A had an assigned homework time, that if he didn’t bring his homework home, he would be assigned homework by me. He had a bedtime that was enforced. He was encouraged to read and explore his interests. He was forced to practice his saxophone daily. We played chess. He did chores. He was disciplined when he make a poor behavior choice. Screen time was limited. We did things together. In short, we did all of the things one would expect a parent of a “good” kid to do. And if I did manage to tell the teacher these things, it was always clear that s/he didn’t believe me. As I would listen to teachers tell me things like, “He’s smart but . . .”, I would cringe inside. As the teacher began to speak in a more and more patronizing tones, I would take a firm grip on my anger with both hands. I would feel furious and guilty at the same time. At school functions I felt like teachers were whispering among themselves, “You see her over there? That’s A’s mom. Did you know . . .” After all, I had heard teachers say such things in the school where I taught, so why wouldn’t the same be true at A’s school? I felt judged and belittled. This repeated for every parent-teacher conference for every year A was in school. I figure that is about 26 conferences, and that does not count telephone contacts or letters or “mid-term reports” that would usually arrive just about in time for report cards to come out and it does not count the times I was asked to come to the school for a “special” conference. Is it any wonder that I felt stressed and angry and fearful at the thought of going to conferences or attending school functions? I can honestly say that in A’s whole school career I only heard one positive thing about him and that was from the school principal when I was called in to discuss some other infraction. Why do I tell you all this? To show that I have a prejudice? To gain some sympathy? No. I tell you this because I have a unique perspective: I’ve seen students’ behavior from both sides of the desk – from the perspective of a teacher, from the perspective of a parent, and, later, from the perspective of a school principal. Because of this unique perspective, I learned something: parents who care deeply about their child’s school success can be alienated from the whole school system. If you’ve taught for any time at all, you know what it is like to deal with parents who are alienated from the schools. These are the parents who do not answer emails, who do not return phone calls, and who do not come to school functions. They are the parents who are hostile when we do catch up to them or who seem to dismiss our suggestions and requests. They can be the parents we dread to contact because we know they will yell or blame us for whatever the student is doing. Eventually we start to shake our heads and talk about how so-and-so’s parents let him or her get away with murder and who just don’t care. Raising A taught me many things. One thing is that parents do care. They may not care in the way you would like them to care, but they do care. They are doing the best they can, and while we educators may not agree with how they deal with school issues, they are trying to raise their child well. Don’t get me wrong! It only takes a single trip to WalMart or the grocery store to see parenting styles that any teacher would classify in the fail column! Nonetheless, parents do care. So why do so many parents act like they don’t care? Because of their previous experiences with the school, and their perception of what the “school” thinks of their child. I tried an experiment when I was still in the classroom. 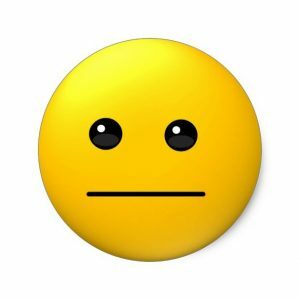 I was reading on my never ending quest to know more about classroom management and discipline, and I found a suggestion that I contact every student’s parent(s) with something positive about him or her at least once a month. I was teaching middle school at the time and saw more than 100 students per day. I wasn’t sure I had enough time to do it, but I gave it a try. I was overwhelmed by the response. I heard parents sob on the other end of the phone and tell me they had never once heard anything good about their child from the school. I had parents tell me that they were surprised that anyone at the school liked their child. Suddenly I had parents describing me as one of the “good” teachers even though I was strict. In fact, they would praise my being strict with their child. The principal called me into her office to tell me that she’d received phone calls about me, positive phone calls. Why did they react this way? I think the parents defined it best: they believed those positive phone calls meant that I liked their child. Later, if I had occasion to make a call about something negative the student did, they were much more willing to listen and to discuss what we, together, could do about it. I tried the same tactic when I became a principal. I could not contact every student’s family every month, but I picked out the kids who had a reputation for being chronic troublemakers. I watched those kids and made calls about the positive things they did. The response again was positive. So besides your relationship with the students, there is another relationship for you to nurture: your relationship with parents. Yes, there are parents with whom it is very easy to establish that positive relationship. It is more challenging to contact the “helicopter” parents and still more challenging to work on the relationship with those parents who have a reputation for not caring or for hating the school system It can be done, and the rewards are enormous. Every positive contact a teacher makes is like putting money into the bank. When that day arrives when the teacher has to make that contact about the student’s negative behavior, that “bank account” pays huge dividends! Don’t forget that not every household has internet access. It costs money that many families do not have, and it is hard to come by in rural areas. Email is convenient, but it is not the only way to contact parents. I learned to love voice mail. I could make a call, leave a quick message – “Hi, this is Ms. Roe from school. I just wanted to let you know that . . .” I came to believe that there was something more personal about using the phone anyway. Give it a try! Hopefully, you are already looking for positive things about each of the students, especially THAT student, as suggested in previous posts. You know some of the reasons we form negative opinions about students and are, hopefully, working on ways to overcome the self-fulfilling prophesy. Take the next step and start to let parents know about the positive things you’ve noticed about their child. It is well worth the effort! Where Do Those Opinions Come From? In the last post, we looked at how the self-fulfilling prophesy can affect teachers and students, and a way to start changing those expectations. But how do we get these ideas about kids in the first place? We will look at that and at another idea for working with THAT student. Have you ever heard another teacher say something like, “Oh, well, you know she’s my BD kid,” or “What can you expect with parents like that?” or “Can you believe that kid was allowed to leave the house dressed like that?” All of those statements show that a teacher has formed a certain opinion about a student, and that s/he believes the other teachers share that opinion. Most schools are based on middle class values and norms (Indiana University, 2016). Anything that falls outside of those values tends to be looked at as something that is not desirable and a threat to the environment. Add to the mix our experiences as brand new teachers who were not particularly adept at classroom management. Our experiences with students who act out become part of our belief system about who is and who is not capable in the classroom. Toss into the mix what other teachers have said about this or that kid and their families, what we read in a student’s file, and experiences with THAT student’s family, siblings, or friends. Remember, the brain’s rules are set up to keep us safe from threats, so anything that deviates from what it sees as normal is perceived as a threat to our school environment and “threat” translates as “stressor”. Previous experience with siblings or relatives – believing that if a student’s older sibling behaved in a certain way, this student will, too. Clothing – if a student wears dirty clothes, clothes that are dissimilar to other students, clothes that are too big or too small, clothes that would be more appropriate on an older or younger child, etc. Hygiene – a student who appears dirty or who smells, and students who do things like pick their noses, wipe their noses on their hands or sleeves. I have never met a teacher who would say s/he treats any student poorly. Every teacher would say she believes wholeheartedly that every student can learn and that s/he treats students equally. And I believe every teacher truly wants to treat each and every student with love and compassion. But our values and beliefs can get in the way. Remember, much of our opinions are formed unconsciously. No matter how a teacher forms his beliefs that certain students are more capable than others, what happens as a result of those beliefs is that he treats the students differently in very subtle ways. He smiles more at those he thinks are more capable. He directs certain kinds of questions to the students he believes are more capable and a different kind of questions to those he believes are less capable. She calls on students to answer different kinds of questions based on her beliefs about the students. In short, the teacher creates a very different kind of social and emotional climate in the classroom for those she believes are more or less capable than others. And this happens in the exact same classroom at the exact same time. Students are perceptive and they can tell if a teacher likes them, or if a teacher seems stressed out when interacting with them. Look at the bulleted list above and think about whether or not THAT student fits into any of those categories. If s/he does, think about how you might be treating him/her differently than other students. If nothing particularly comes to mind, don’t panic. Remember, much of this is unconscious. Next, resolve to get to know THAT student a little better. What does THAT student do when not in school? What makes THAT student laugh? What does THAT student know a lot about? What does THAT student want to be when s/he grows up? Now, you may not always like or approve of the answers to those questions, but that is not the point. The idea is to get to know THAT student a little bit better. The final thing to do, to improve classroom management, is to try to set a friendly tone for THAT student and for all the students entering the classroom. Harry and Rosemary Wong recommend greeting every student at the door. Standing at the door and saying, “Good morning” or “How are you today?” or “Did you see that play in the last quarter?” to each student is a step towards creating a friendly, respectful classroom environment. If you want to take another step forward, try shaking hands with each student as s/he is about to enter. This isn’t as easy as it sounds. When we have had negative experiences with a student, it is much more difficult to look at him/her directly, to smile at him/her, let alone shake his/her hand. On the other hand, it is a bit more difficult to act negatively towards someone you’ve greeted in this way. Remember, there are no magic bullets when trying to turn around THAT student. Celebrate your baby steps. You may even want to make a little, secret list of the things you’ve done to create a positive relationship with THAT student, and try to add something to that list every day. Next time we will look at another idea you can start using right away with THAT student. Sezer, S. (May 2017). Novice Teachers’ Opinions on Students’ Disruptive Behaviours: A Case Study. Eurasian Journal of Educational Research (EJER), 199-219. Wong, H. and Wong, R. (2018). The First Days of School: How to be an effective teacher 5e. Harry K. Wong Publications. Posted on September 23, 2018 September 23, 2018 Categories Self-Fulfilling ProphesyTags classroom management, negative behavior, negative opinions, self-fulfilling prophesyLeave a comment on Where Do Those Opinions Come From? The school year starts and you’ve prepared well. Things start out pretty well, but THAT KID has crossed the line a few times already. 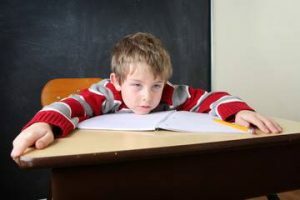 You give the consequences you’ve specified in your discipline plan, but THAT KID doesn’t seem to care and continues to push the limits. You’ve called home but the parents were hostile and defensive. You’ve sent THAT KID to the office, but that didn’t help. Your stress level increases. You start to wonder why THAT KID is never sick. You’ve done just about everything you can think of except deciding to move to France. The mere mention of that kid’s name makes you tense up. That is what we are going to look at in this blog: Just what you can do to turn THAT KID around, or at least give you some peace and less stress. THAT KID could be any kid, at any age, male or female, rich or poor, any race or ethnicity, any religion or creed, any level of intelligence. However, it is more likely that certain kids get a reputation for being difficult. We will look at that in the next post. Let’s look at one of the reasons why THAT KID seems to push your buttons. Have you ever considered buying a certain car (or other item)? You’ve given it some careful thought and you think you know what you want. Suddenly, you start seeing that particular kind of car almost everywhere – in the grocery parking lot, waiting for the light to change, going down the street past your house. Every teacher consciously believes that s/he gives every student an equal chance to succeed, however the Baader-Meinhof phenomenon contributes to a self-fulfilling prophesy, something that happens without our conscious effort. 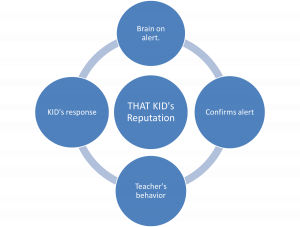 It works like this: you develop a particular idea about a student; you see the student do something and attribute that behavior to what you’ve heard about the kid; that confirms what you’ve been told. That confirmation means we look for the behavior all the more, and that means we act a bit differently towards that kid and s/he lives up or down to the expectations our behavior has communicated to him/her. What’s worse, the whole process is subconscious. Let’s be very, very clear – we do not do this consciously. This is unconscious, and not done on purpose! Few if any teachers consciously think: I can’t wait to treat THAT KID differently than I do the rest of the class. This information is all well and good, but what can you do right now, today, to start to relieve your stress? Try this: make a list of good things about THAT KID. This isn’t always easy, especially if THAT KID has been a thorn in your side for a while. However, by consciously thinking, “I want to notice good things about THAT KID,” you start to break the cycle of the self-fulfilling prophesy. For example, you might start to eavesdrop when THAT KID whispers to another and find out THAT KID is just asking to borrow a pencil, or you may hear THAT KID is asking if the other student wants to borrow something. It’s that simple: start to really look for good things about that kid. Yes, it may be difficult to do, but there are rewards that are almost immediate. First, it is much more pleasurable to look for positive things than it is to only notice negative things. Second, you are less stressed when you think about positives because when you do not notice mostly negative things your body does not react as if you are in a threatening situation. Third, you begin to chip away at that self-fulfilling prophesy which is the start of a turn-around for THAT KID. Next time we will look at how kids get a negative reputation. You may be surprised at some of the ways.